I'm headed to Billund in September. The tickets are booked and the bricks are being packed. I'm excited to see the headquarters for LEGO and get a sense of the company. Johnny Cash had Jackson, I've got Billund. 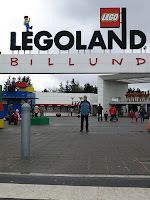 I'd love to hear from people who have made it to LEGOLAND in Denmark for their recommendations of what I have to see. Please feel free to let me about other travel recommendations in and around Billund as well. And since seeking out local cuisine is in my DNA, what's good on the plate?